A database solution to ease and automate processing and maintaining of fragmented data, allowing for better chemometrics, more experimentation, more frequent model updates, and optimize use of personnel. Built on the amalgamation of experience from 15 refinery optimizations and a lot of R&D effort over the last 5 years, the whole process of Ai-Metrix is designed to take less than one hour, including transit time. Ai-Metrix uses an evaluative process that provides a database with search and matching capability and a dashboard interface allowing a user to visualize trends and comparisons of the data through a graphical output; the matching of such data being essential to calibration studies and future predictive models used in laboratory and process environments. 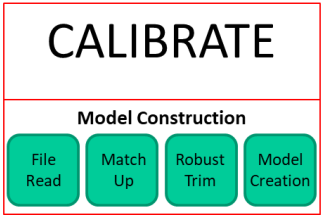 Additionally, Ai-Metrix can provide calibration modeling and prediction capabilities in routine and automated situations with little or no human interaction. A service component is also available in Ai-Metrix, in which Infometrix staff develop, review, implement and maintain calibration services for the end user. Read about the process below or view in Ai-Metrix Overview Slides in pdf format. 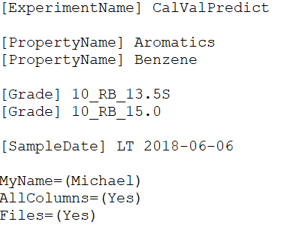 A simplified approach to assembling lab values and spectra into a common database. Long-term management both of these data and the chemometric models generated in a browser-based, customizable, interactive set of visualizations. An objective and automatable procedure for selecting the samples that would be best for the calibration. Automated guidance on how many factors to include in the model. An automated mechanism for determining that a calibration requires updating and a more objective way to do those updates. A universal system that is completely independent of ANY manufacturer of spectroscopy gear and will support ALL legacy software. The result insures uniform quality models across the organization. This is the baseline Infometrix service and ensures a best-practices approach to model development. Models should be reviewed and a dashboard is supplied to facilitate. Infometrix can also translate models into any format as required. Because all models are maintained by the database, prediction quality can be tracked over time using the dashboard. The service includes customized graphical displays that allows the user to spot inconsistencies and plot trends for any range of dates. 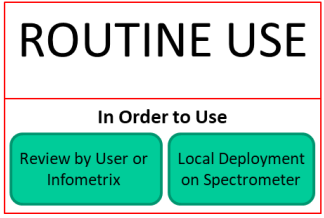 A Pirouette model that can be used for routine QC assessments, plus any supported non-Infometrix model file as specified by the user, OR the files necessary for the user to build the model in any chemometrics software is also created. Models can be built for any property and any subset managed by the database. 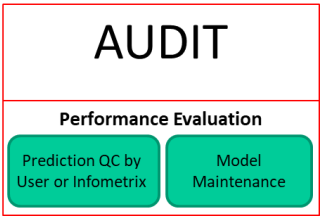 These data are trimmed of outliers, a PLS model is constructed, and the number of factors is set according to Infometrix best practices. The models are delivered to the customer computer within minutes. Model visualization and performance over time is available on an instrument-specific Tableau dashboard. More than 70 diagnostics are computed and used in the assessment of model quality. The visualization is easily customized. Model diagnostics are added to the database and the on-line interactive dashboard is automatically updated to display current model quality and compares to all prior models and, in some cases, compares to industry standards. The base service is designed to handle up to 20 properties per prediction, but any number of models can be created and maintained. We consider these to be preliminary models, but can serve as a baseline for any optimization that the user may do. A one-time setup cost and monthly fee applies. Contact us now for more information, WebEx presentation of the process or a quote.